Megan Seres is an emerging artist, living and working in Regional NSW Australia. In the pursuit of understanding social structures that include objectification, oppression, beauty, displacement, adornment, isolation, memory and the environment, Megan seeks the intersection between past, present, future and its residual interchange. 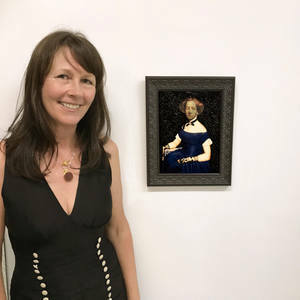 "Many of my paintings to date have had a Gothic sensibility and are drawn from 17th to 19th century discourse and motifs found in art, poetry, texts, fashion and films. Working with my own photographs or found images I reinterpret these into paintings, referencing the old masters use of chiaroscuro (light & dark), oils, mediums and glazes, acrylic and various substances are also used. The use of charcoal, ink, graphite and colour pencils are used in drawing whilst various mediums such as ceramic, wax, felt, found objects and soon to be alabaster is used in sculpting. Both drawing and sculpture will be revealed at the end of the year. Experimentation within my art practice has become a key component in creativity which helps to express the unique power of ambiguous narratives and the exploration of the boundaries between what is observed, what is imagined and what is hidden or forgotten is of enormous importance to my work."